THE council's annual general meeting will be held this Thursday, December 13, in the New Norfolk Courthouse at 6pm. I encourage all interested residents and ratepayers to download a copy of the annual report from the council website here, or to obtain a hardcopy from the council chambers. The AGM is your opportunity to ask questions about the council's activities over the last financial year and to propose motions from the floor - which if carried by the members of the public present, must then be considered at the next council meeting. The December council meeting will follow the AGM at 6.30pm. I do hope you can join us for one or both meetings. If you would like to know more about how council meetings operate, please get in touch. THESE are the questions without notice I asked at the October council meeting held at Granton, and the answers received. Mr Mayor, can we start community forums at a later time, such as 6.30pm, to encourage greater public participation? The mayor took the question on notice. Mr Mayor, will you make inquiries of the relevant authorities regarding the future of the historic Watch House at Granton and its ongoing maintenance? The mayor advised that he would pursue the matter. Mr Mayor, can you update us on the search for tunnels beneath Willow Court? The mayor advised that the Hon. 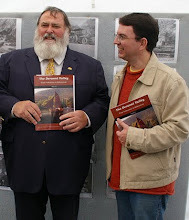 David Llewellyn had been researching the matter in the state archives and had found historical references to the tunnel dating to 1834. The mayor said he would liaise with the new licensee of the Bush Inn Hotel and a member of the public who had seen the tunnel beneath the hotel. Mr Mayor, what decisions were made about fencing at last week's meeting of the Willow Court Conservation Special Committee? The mayor advised that he would answer the question in closed committee. Mr Mayor, why has nothing been done to acknowledge our four local Olympians in the two months since their return home? The mayor advised that he had invited one of the Olympians to participate in the recent Rally for Respect but they were unable to attend. FOLLOWING is my most recent councillor update, published in the Derwent Valley Gazette a fortnight ago. For people in the Upper Derwent Valley and parts of the South East and Midlands Forecast Districts. Issued at 11am Friday, 9 November 2012. THIS INCLUDES A TORNADO WARNING. Severe thunderstorms are likely to produce destructive winds, heavy rainfall that may lead to flash flooding, large hailstones and tornadoes in the warning area over the next several hours. Locations which may be affected include New Norfolk, Oatlands and Richmond. * Move your car under cover. The next warning is due to be issued by 2pm. Warnings are also available through TV and Radio broadcasts, the Bureau's website at www.bom.gov.au or call 1300 659 216. LAST week's council meeting at Granton authorised the forming of a working group to review and make comments on the recently circulated discussion paper titled “Proposed Changes to Local Government Electoral Arrangements". Appointed to this working group were mayor Martyn Evans, deputy mayor Barry Lathey, councillors Tony Nicholson, Wayne Shoobridge, James Graham, Chris Lester, Scott Shaw and myself, and general manager Stephen Mackey. With a request to provide feedback on the four proposals by the end of this month, the working group met this Tuesday to consider the the council's position. Present were the general manager and councillors Lathey, Nicholson, Shoobridge, Lester and myself. Introducing opt-in compulsory voting whereby a council may choose to make voting in local government elections compulsory within its municipal area. The Derwent Valley Council will not support this proposal. The working group's preference is compulsory voting for all councils. Introducing all-in, all-out elections every four years, with four-year terms for Mayors and Deputy Mayors. 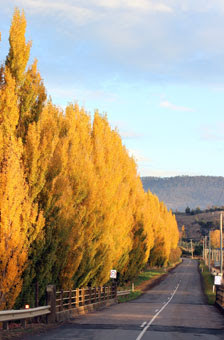 The Derwent Valley Council will support this proposal. Moving to election of Deputy Mayors "around the table" rather than by popular vote. The Derwent Valley Council will not support this proposal. The working group's preference is for mayors and deputy mayors to be elected in the same way - by popular vote. Banning dual representation, so that a person cannot in future hold a seat on council and in State Parliament at the same time. The Derwent Valley Council will not support this proposal. The working group's preference was that mayors and deputy mayors elected to parliament be permitted to serve out the remainder of their council term and that there be no restriction on councillors elected to parliament. My personal view is that dual representation is not ideal but should not be illegal. Mr Mayor, will Council be holding a function on the return of our Olympians? The Mayor advised that Council will consider this matter. Mr Acting Mayor, Can we have a clarification of the purpose of the council's advertisement seeking tenders for the installation of a power supply at Willow Court? The General Manager answered that the advertisement was for the digging of trenches for the power supply. Mr Acting Mayor, What will the council be doing to acknowledge the return of our local Olympians last month? The General Manager took this question on notice. As of today, no answer has been received. Mr Acting Mayor, Can we have a clarification of the legality of amending councillor motions on notice? On some occasions such amendments are permitted and on other occasions they are not. Mr Acting Mayor, what payment does the council receive for the maintenance of the privately owned Woolworths car park in New Norfolk? The General Manager said he was not aware of any payment being received. Mr Mayor, why does the council perform maintenance of the Woolworths car park if it receives no payment for doing so? The General Manager said this was a community service obligation. THESE are the questions I asked at the July council meeting, and the answers received. Mr Mayor, can you tell us about the $800,000 cheesery and restaurant recently approved in Rowbottom's Rd, Granton. Answer: The mayor mayor took the question on notice. (As of today, no answer has been received). Mr Mayor, who owns the Woolworths car park in New Norfolk? Answer: The general manager advised that the car park was owned by Mr Robert Rockefeller through his company Humana or Nekon. Mr Mayor, has the council received any communication from the Minister for Local Government regarding his proposed reforms? The mayor advised that the council had not received any such correspondence from the minister. He further advised that he would write to the minister to ask what consultation would take place. 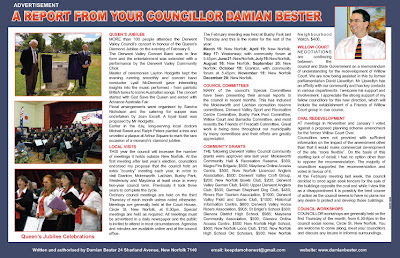 THE latest issue of the Derwent Valley Council newsletter (Winter 2012) is available for downloading from the council website here. HERE are the formal questions I have asked at the last few council meetings. Mr Mayor, have we had a written answer from the Police Minister regarding the failure of a police representative to attend our recent workshop on Willow Court security? Answer: The Mayor advised that a letter had been sent but a reply had not been received. He has however received a verbal acknowledgement from the Minister that the letter had been received. Mr Mayor, has the Council contacted Malcolm MacDonald in accordance with the council's decision of last month? Answer: The General Manager advised that he hadn’t but will follow it up. Mr Mayor, will you provide us with an update on your search for a tunnel beneath Burnett St? Answer: The Mayor advised that he was having a meeting soon with Rebecca White MHA regarding UTAS and their groundpenetrating radar. Can the Accountant provide an income and expenditure report for the first six months on the Carinya Education Park? Answer: The General Manager advised that an income and expenditure report would be provided. Will the council contact the Department of Infrastructure, Energy and Resources to request a co-operative approach to the provision of a footpath at Westerway? Answer: The Mayor advised that Stuart Taylor is pursuing this issue and it has also been included in councils budget. Will the Mayor give an update on the search for tunnels beneath Burnett St? 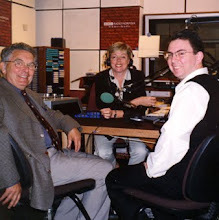 Answer: The Mayor advised that he would take this matter up with Mr David Llewellyn AM and his new committee. That the General Manager will be taking it up with the University of Tasmania Thermal Imaging section. The Mayor will also take the matter up with Rebecca White MP. 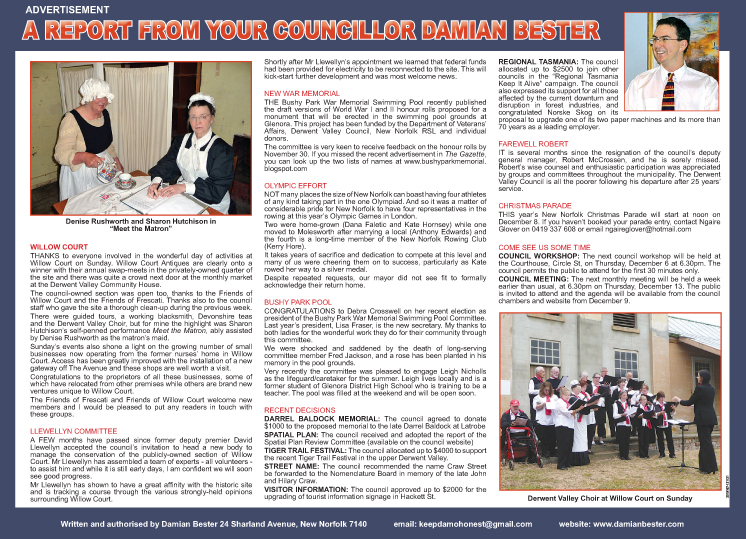 Cr Bester Mr Mayor why was advertising material for a nursing home posted out in envelopes with the Derwent Valley Council logo on them this month? The General Manager advised that discussions had been held with Corumbene in regard to sending out the flyer with Council rate notices, unfortunately this did not happen and they were forwarded out separately. They had also asked if they could be provided with the detail so they could do the mail-out of which I advised privacy legislation would not permit Council to pass this information on. How many were posted out? The General Manager advised that approximately 1100. The General Manager advised that he would have to get back to him in regard to the cost. How was it determined who received the flyer? The General Manager advised that it was forwarded to those that have a pensioner discount or are the holder of a Centrelink Healthcare Card. Corumbene has advised that they now have the longest waiting list that they have ever had and that this will assist with occupancy rates for their newly build units. Unfortunately I am unable to advise if this mail-out was the main reason for this. SEVEN of your councillors spent most of yesterday in a workshop to review the new planning scheme for the Derwent Valley Council. This will cover all land use matters between Granton and Strathgordon. All of Tasmania's municipal planning schemes are now under review, to bring them into line with a common model and introduce relative consistency throughout the state. In our case this is long overdue, with the current New Norfolk Planning Scheme have being adopted in 1993. There is still much work to be done, including determination of where these zones might apply. I'm particularly interested to hear the thoughts and opinions of Derwent Valley residents on two matters at this stage of the planning scheme process. The proposed Rural Resource Zone includes a prohibition on subdivisions. In order to prevent further fragmentation of rural resource land, there would be no subdivision of new lots in this "zone". This relates particularly to large farms being subdivided and rendered unsuitable for major agriculture. What's your opinion? Past and present planning schemes have sought to protect and preserve High St as the municipality's main commercial centre. The new planning scheme's proposed Commercial Zone would allow "big box" type developments in New Norfolk, but away from the central business district. What do you think? THE Derwent Valley Council budget for the 2012/13 financial year was approved at last week's council meeting, carried by a majority of eight votes to one. As I had expressed in earlier council workshops, councillors had not done enough to reduce expenditure and avoid the forecast 5% increase in rates for the next year. As a last resort I proposed that councillors take a 20% cut in their allowances in order to bring the rates rise down to 4.5% but that also failed. "Mr Mayor, I would like to take this opportunity to acknowledge the work of all council staff involved in the preparation of this budget. I am not satisfied with this budget but that is not the fault of the staff. At a time of ever increasing costs for water, electricity, fuel and other essentials, I cannot support the proposed 5% rating increase. "Mr Mayor, not only have councillors failed to rein in expenditure, we are also requested to approval additional expenses in tonight's agenda, possibly adding a further $14,000 that is not budgeted for, as well as a blank cheque for the RAFT partnership agreement. "Six months ago this council adopted a similar blank cheque approach to the former business enterprise centre, now called the Carinya Education Park. This was stated to be at a minimal cost, which has turned out to be more than $19,000 in half a year, while the income received was about $1800. "The 5% rates increase is not necessary Mr Mayor. For example, it is not necessary to re-seal a short dead-end laneway to highway width, and some footpath reconstruction could have been delayed. "In response to our failure to cut our costs, I have proposed that councillors request a 20% reduction in their allowances. Unfortunately this proposal has been shunted to a closed meeting away from public scrutiny. 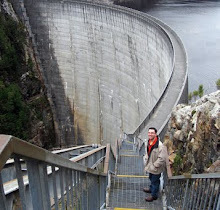 "On the whole, Tasmanian councils have managed lower increases than that proposed tonight. One council to our north has even introduced a $20 rate rebate." WILLOW Court was the main topic discussed at this month's councillor workshop, held on May 3. Deputy mayor Barry Lathey took the chair in the absence of the mayor, who is on personal leave this month. It was great to have two members of the public present (Anne Salt and Allyson Lock) with some questions about the council's policy on film-makers visiting Willow Court. Also in the gallery was Tim Morris MHA and it emerged that he had been called to the meeting to account for comments had had not made in Parliament. That exchange was saved for the closed section of the workshop. Anne Salt and Allyson Lock expressed their concerns at film-makers exploring paranormal themes at Willow Court, which prompted an interesting discussion that extended beyond the 30 minutes now allowed for public participation at workshops, and I thank the deputy mayor for his tolerance in that regard. Cr Nicholson expressed the view that paranormal types had jumped onto the Willow Court committee formed back in 2009 "when the community squealed". The closed section of the workshop featured a presentation by security consultants recommended by Cr Lester. They spoke about the problem of Willow Court's isolation and lack of use and proposed a multi-faceted approach to security based on a site inspection with the mayor, general manager and Cr Lester. Their confidential report will be discussed in a closed session after this week's council meeting. In response to a question from me, the general manager advised that comparative quotes would not be provided. (1) Notes that the Willow Court Historic Site at New Norfolk is a significant part of Tasmania's built heritage and should be protected in its entirety. (b) those community members, such as the friends of Frescati and the Willow Court Working Group who have volunteered their time to work on the site. (b) that a further building has been deliberately burnt beyond repair because of a lack of care by the council. (d) respond positively and promptly to the Government's proposed Memorandum of Understanding that will define rights and responsibilities and provide state funds for work on the site. Council general manager Stephen Mackey asked Mr Morris what he had done in Parliament to help the council. Mr Morris said he had lobbied and supported and had not criticised the council until the loss of F Ward. When asked about critical comments he had made when his motion was debated in the House, he pointed out that it had not yet been brought forward. As the workshop drew to a close, Mr Morris asked about the future ownership of the former business enterprise centre, now known as the Carinya Education Park. Mr Mackey said the council had a two-year lease and option to acquire the property. It was reported that the buildings were suffering from vandalism. ANOTHER month has flown by and it's now only a couple of days until the May council meeting, which will be held at Westerway this Thursday night, starting with a community forum at 5.45pm. Please do come along. You can download the council agenda documents here. Last month's meeting saw some great debate on a couple of issues. My colleague Cr Lester certainly sparked some controversy with his motion on notice seeking some information from the Willow Court committee. I voted against this motion as I believe the information he requested is already available on the council website in the form of minutes and an annual report. Cr Lester amended his motion at the meeting and it was carried by majority. Next on the agenda was my motion on notice, calling on the council to cease charging the costs of offices at 2 High St to the Royal Derwent (Willow Court) Reserve Account. From my speech notes: "Mr Mayor, this is a straightforward motion. Since 2002 nearly $350,000 has been charged to Willow Court for the costs of the offices at 2 High St. There has been some income from the same source, but the total loss has been about $230,000. I believe the figures have been provided to all councillors. In the current financial year, income from 2 High St has been nearly $9000 but the costs have been $37,000, for a total loss of $28,000. These charges are for offices which no longer have any connection to Willow Court. The tenuous link via Valley Vision was severed more than two years ago and the costs should cease being charged to Willow Court." This motion generated some discussion and was supported by the majority of councillors. My second motion was for the general manager to investigate and report on the apparently excessive cost of electricity at Willow Court. So far this financial year, Electricity costs of $24,000 have been charged to the Willow Court account. An investigation into this cost was supported by all councillors. I did not support the adoption of an updated council policy on councillor allowances as I do not agree with the payment of additional allowances on top of the fixed payment that is already made to councillors. From my speech notes: "Mr Mayor, I will not be supporting this motion. I made these remarks at the committee level and repeat them here for the benefit of the council. 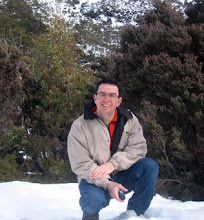 While the prescribed allowances are within the law, I believe they are unnecessary and excessive when Derwent Valley councillors already receive a fixed yearly allowance of nearly $11,000 each, the deputy mayor receives nearly $21,000 and the mayor receives more than $37,000. The Lord Mayor of Hobart receives a fixed allowance of more than $100,000 per annum, plus a car and driver. Additional allowances for travel, phone calls, child care and other things are within the law, but I regard them as double-dipping when councillors already receive a generous allowance that increases every year." All other councillors voted in favour of the policy. I did not support a proposed new Highways and Stormwater Bylaw as I believe it is unnecessarily draconian in some aspects. The bylaw is intended to control such things as the roadside sale of cars and the growing number of roadside signs. All other councillors voted in favour of the new bylaw. The public will be able to have its say before it becomes law. From my speech notes: "Mr Mayor, I will not be supporting this draft bylaw in its current form. I believe it is excessive to fine a person $390 for driving on the road with dirty wheels, and I am not convinced that we are bedevilled by persons going door-to-door seeking to buy rag and bone and that they should be fined $260. I would also make the point that items such as this draft bylaw are ideal for actual workshopping by councillors at their monthly gathering, rather than having their first discussion take place at a formal meeting." All councillors voted in favour of the Memorandum of Understanding with the State Government, but not before several of us expressed our disappointment with the document. From my speech notes: "Mr Mayor, I am far from satisfied with this latest version of the MOU. In effect it obliges the government to nothing and the council to everything. I believe the only real advancement is that we have the support of a man of goodwill and good intent in David Llewellyn and at this stage I will put my trust in him rather than the government." For the benefit of those friends who wonder whether I ever support anything, I voted in favour of routine items including the monthly financial report and planning applications dealt with by delegation, as well as the new customer service charter, and a proposed review of councillor numbers, but I voted against the council going into closed session to discuss two items behind closed doors. 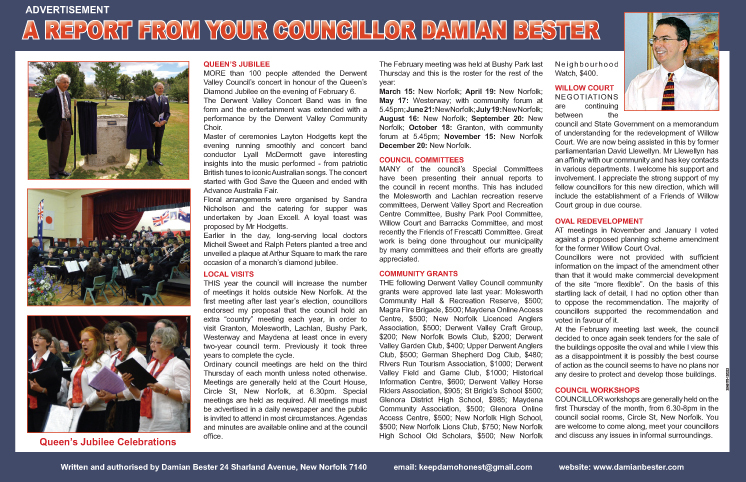 THE Derwent Valley Council has recently issued its latest newsletter. Click here to download a copy. MINUTES of the council's March meeting were ratified at the April meeting. Unfortunately the answers to my questions, recorded in the minutes, do not match what was said and by whom. Here are the topics I raised during "questions without notice" at the end of the March meeting, followed by the answer recorded and the actual answer given. Mr Mayor, will you provide an update on what has happened at F Ward since the fire? Answer recorded: The Mayor advised that Council has gone through the process and it is being demolished under the Work Place Standard regulations. Actual answer: The mayor said the building had to be demolished. The general manager said an insurance assessment had been conducted and council insurance would cover the cost of the removal of debris from the site. It was becoming clear that re-use of the bricks may not be possible. Mr Mayor, will our insurance cover anything other than the removal of debris from the site of F Ward? Answer recorded: The Mayor advised that the removal of debris is covered under our insurance and the building is also insured. The amount will be a matter of negotiation with the insurers. Actual answer: The general manager said substantial argument was likely over the value of the buildings. Mr Mayor, was the F Ward foundation stone salvaged as requested? Answer recorded: The Mayor advised that we will investigate the issue in regard to the foundation stone and if possible have it salvaged. Actual answer: The general manager said he did not know and would find out. IT looks like it will be a great day in New Norfolk this Sunday, with opportunities to visit some of the buildings at Willow Court between 11am and 3pm, and a free barbecue at the Frescati garden between noon and 2pm. I'm sure a gold coin donation would be appreciated by the organisers of both events. I spent a couple of hours helping to sweep out C Ward at the weekend and look forward to this and other buildings being progressively restored and appropriately interpreted for future visitors. I SPENT a couple of hours at Bushy Park this afternoon, helping to get the War Memorial Swimming Pool hall and grounds ready for Anzac Day. Thanks to the volunteers from the hall committee and the Loyal Glenora Lodge for their great work. The Anzac Day Service will be at 11am this Wednesday (all welcome). There will be a barbecue and eightball afternoon afterwards. The poplars were looking their autumnal best and I took this photo during a break from wheelbarrow duties. 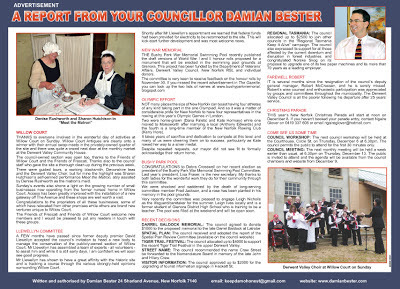 BELOW is my latest councillor update, published in the Derwent Valley Gazette on April 18, 2012. ADVERTISED with only one day's notice, it's hardly surprising that there were no members of the public in attendance at the council's monthly workshop last Thursday night, the eve of the Easter long weekend. I was disappointed to see that the round-table setup had been abandoned and a separate row of chairs had been provided for the public, away from the table. Willow Court was the first topic discussed and it dominated the evening. The general manager advised that he had just received a new draft memorandum of understanding (MOU) on Willow Court from David Llewellyn, who had been appointed to chair the yet-to-be-established Willow Court Conservation and Development Special Committee. He had also received a deed of variation for the long since lapsed State Government grant for Willow Court. Mr Mackey said the variation would allow the $750,000 grant to be used on various buildings at Willow Court. He understood that the government had accepted the amended MOU and noted that it did not provide staff for the site. Mr Mackey said Mr Llewellyn would advise the council on appointments to the new committee but finding volunteers may be a challenge because the positions are unpaid. Cr Judy Bromfield said she hoped the MOU would be ready to be signed at an open day at Willow Court on May 6. Cr Lester asked whether there was any offer on the table about the funding of a project manager for Willow Court. Mr Mackey said it was necessary to firstly establish the new committee so it could review the MacDonald report, prepare a program of works and then get a project manager on board. Mr Mackey said he was not talking about having a project manager on site all the time. Cr Lester asked whether it might be possible to work with the Southern Midlands Council, which has a heritage officer. Mr Mackey said there had been a conversation and it had some merit. At this point I expressed some concerns about what had been said so far. I asked whether the full amount of the $750,000 State Government grant still remained and the general manager responded that it was now closer to $580,000. It seemed to me that the council's approach to Willow Court had been turned on its head and this would result in more delays. Having initially rejected the government's offer because it did not provide a project officer for Willow Court, this principle now seemed to have been abandoned. The council decided last year that the new committee should be established without delay, but others decided not to start the committee until the MOU was negotiated and a project officer appointed. Now the general manager was proposing that the committee be established and that it would review the MacDonald report and prepare a program of works, and then there would be negotiations for the provision of a project officer. In response to questions from myself and Cr Scott Shaw, the mayor advised that the State Government would in fact pay for a project officer even though it was not specified in the MOU and it was possible there may be short-term managers responsible for specific tasks rather than one for the whole project. While I am not happy with this latest change in approach, too much time has been wasted by the council in the negotiating of an agreement with the government. We have tasked David Llewellyn to lead the conservation and development of Willow Court and I believe he will do his best. This was echoed by Cr Bromfield who observed that the MOU did not say all she would have liked it to say but Mr Llewellyn would do everything he could. Cr Lester asked how much money was left in the Willow Court reserve account other than the $580,000 grant money and the general manager responded "that's it." Cr Lester then asked whether anyone had spoken to Heritage Tasmania about demolishing G Ward (Glenora House) at Willow Court, with a view to making the site more attractive for development. Mr Mackey said he had spoken to Pete Smith at Heritage Tasmania and he would not be averse to receiving such an application, although "we would never get one through in relation to the two-storey buildings". Mr Mackey said he would prepare a report on the MOU and deed of variation for the next council meeting. Still on the subject of Willow Court, Cr Shaw asked why the barracks building couldn't have a fence like that around Frescati. Mr Mackey said his preference was to have a fixed fence rather than to continue to hire a temporary fence. Cr Lester said the owner of the administration building had a proposed an aesthetically pleasing fence and lighting project and I asked when the council would meet private property owners to discuss fencing at Willow Court as had been decided in January. Moving on, Mr Mackey said he had been speaking to Paul Lennon who was negotiating on behalf of another property owner at Willow Court to resolve access issues affecting the Lions Club and Masonic Lodge. HEARING councillors support moves to restrict public attendance and participation at our monthly workshops was more than disappointing, especially from those who had previously espoused openness and transparency. At last month's council meeting the agenda included the report of a working party formed to investigate the pros and cons of establishing a formal committee system at the council. This related to things such as planning, finance and audit committees and not the council's range of existing Special Committees. It's certainly an understatement to say this report went in a different direction than was expected. It was formed to investigate the introduction of a committee system and recommended against it. It recommended consideration of an audit committee; closing workshops to the public after 30 minutes; and reviewing councillor membership of committees every 12 months. That the report be received and noted. That the council establish an audit committee in accordance with the recommendations of the Auditor-General in his report of November 2011. Unfortunately this did not win the support of any councillors other than deputy mayor Barry Lathey. That Council continues the current practice of having no formal committees. That consideration is given to the establishment of an Audit Committee that would meet on a quarterly basis. That the current structure for Workshops be amended by having a forum for the first half hour which will be open to the public and a closed section for an hour and a half for councilor discussions. That Council on an annual basis review the councillor membership of all committees, to allow for the rotation of councillor representation on these committees. Mr Mayor, I had tried to adopt a moderate response to this matter, which was clearly unsuccessful. Now let me be equally clear: the report before us is the report of a committee which has exceeded its authority. This working party was established with one purpose - to investigate the possibility of setting up a committee system. Having decided against a committee system, the working party should have stopped there. Instead, it took it upon itself to investigate workshops and committee representation. That is where the committee exceeded its authority and this is where it should stop. When this committee's progress was discussed at a recent workshop, my recollection was that the councillors present expressed their clear desire for a planning committee to be established. Instead, the committee has reached the conclusion that a committee system in some way lacked transparency. On the subject of workshops, it is clear that some councillors have been opposed to the participation of the public for some time. To address this, the committee proposes a new form of meeting, the closed workshop. Mr Mayor, there is no such thing as a "closed workshop". I challenge anyone to find "closed workshops" in the Local Government Act or the Local Government Meeting Procedure Regulations. Mr Mayor this is the second attempt to restrict public participation at workshops. The first was the cruel hoax of ceasing advertising but claiming the meetings were still open. The working party's report gives the lie to that ridiculous situation. It will be a backward step to ask the public to leave council workshops after the first 30 minutes as is proposed. No matter how it is dressed up, it will leave the public quite rightly asking: "what do they have to hide? What don't they want us to know?" Mr Mayor the Local Government Act provides ample opportunities, generous opportunities, for closed meetings when they are required. Everyone here knows my opinion on the frequency of closed meetings - and we have another one tonight. In coming up with its unexpected recommendation Mr Mayor, the working party has also failed to consult public on its proposal. The public is to be evicted from each workshop after a mere 30 minutes, and they have not even been asked their opinion. Mr Mayor, before I resume my seat I will briefly address the panel’s final recommendation, for a yearly review of committee memberships. This too is excessive. Committee membership is already reviewed every second year, and should remain so. A yearly review would be unnecessarily disruptive to the committees we represent. Notice is hereby given that Council will be holding a public meeting at the Social Rooms, Circle Street, New Norfolk on Thursday, 29th March 2012 commencing at 6.30pm. The public meeting is to discuss matters in regard to the fire at the Banjo’s building in New Norfolk. DUE to an attempted identity-theft last week I have had to adjust the settings on the "comments" function of this blog. Earlier in the week I received a comment from a person claiming to be one of my fellow councillors. The same person posted several inflammatory anonymous remarks at the same time. When I checked with the councillor concerned I was told the posting was fraudulent. THERE has been some spirited discussion of council matters here and on the New Norfolk News website, in response to recent events including the devastating fires in Willow Court and High St, as well as the council's decision to close future workshops to the public after the first 30 minutes. It has been said that my proposal to put up a security fence was a knee-jerk reaction to the loss of F Ward and I can see how some might have reached that conclusion. However, it was last December that I first raised this particular fencing issue at a council meeting. It came up again at a closed meeting in January and councillors voted to defer consideration for "a month". It has also been correctly pointed out that we do not have any security or fencing experts on the council and that such people should be consulted before any money is spent on a fence. I agree with those sentiments and that's why I asked for the police and fire brigade to attend our workshop on Willow Court security held on March 8. You can read about that here. The closed council meeting in January agreed that the mayor should call a meeting between councillors and the owners of private property at Willow Court, to discuss the fencing issue. Two months have now passed without that meeting taking place. Willow Court has reached a crisis point and I make no apologies for ruffling a few feathers at the council table. I will continue to work for the proper protection and development of Willow Court as promised when I stood for election. MINUTES of the council's February meeting were ratified at the March meeting last night. Here are the topics I raised during "questions without notice" at the end of the February meeting, held at the Bushy Park War Memorial Swimming Pool Hall. Mr Mayor, do we have an answer from Southern Water in relation to the unexplained delay in the installation of water meters in the municipality? Answer: The general manager advised that the contractors had left New Norfolk for water meter installation in Lenah Valley but he is advised they will return to finalise installations in New Norfolk by 30 June. Mr Mayor, has the council responded to Mr Tim Morris' letter regarding the recently constructed road to the river's edge below Glenora Rd? Answer: The deputy general manager advised that the council had received a Right to Information request from Mr Morris but had yet to respond. (The minutes do not record that I then advised the mayor I was referring to a letter Mr Morris had sent to the mayor and general manager, not his RTI request, and that the letter referred to the council constructing a road across private property without permission of the owner. This prompted the following answer which is recorded in the minutes): The general manager advised that he and the deputy general manager had met with the property owner who is more than happy with what has happened. (The minutes do not record that "what has happened" is that the council will compensate the property owner by carrying out work on his other property nearby). Mr Mayor, will you update us on the search for the tunnel beneath Burnett St? SADLY disappointed is the only way to describe my feelings after tonight's council meeting. Some kind observers have congratulated me on seeing four of my nine motions supported by the majority of councillors, but there is no escaping the fact that six councillors opposed my proposals to protect Willow Court. The devastating loss of F Ward has shaken many of us who care about the site but most of your councillors appear to be unmoved. Equally disappointing is the fact that tonight's meeting saw the majority of councillors vote to exclude the public from our monthly workshops after the first 30 minutes. But that's another story. Motion 1. That this council proceed immediately with the installation of permanent security fencing around Wards D, E, F and G at Willow Court. Motion 1a. That council make urgent application to the State and Federal Government for sundry grants to contribute towards the cost of fencing Wards D, E, F and G.
What I said: Mr Mayor, This is a common sense response to the disastrous position this council and this community finds itself in after a decade of neglect at Willow Court. This motion deals with security fencing. I do not need to remind council of my comments here three months ago when I sought a price for the secure fencing of Wards D, E, F and G. And I do not need to remind councillors that once we had that price, they decided to defer consideration of such a fence for a month. That was two months ago. In those two months we have had more vandalism, more destruction, and the loss of one building to fire. It is time to stop deferring and to put up the fence. Mr Mayor, we should also make urgent application to the State and Federal Governments for financial assistance specifically for security measures. Perhaps we should also ask Leo Schofield. Motion 2. That this council proceed immediately to expand the fenced enclosure around Frescati to include the house garden area, including the pond and hedge, and the installation of electronic security inside the fenced area. Motion 2a. That council make urgent application to the State and Federal Government for sundry grants to contribute towards the cost of expanding the fenced area around Frescati and electronic security. Motion 2b. That council develop procedures with the Friends of Frescati to ensure their continued access to the site. What I said: Mr Mayor, we have an excellent security fence around Frescati and this was an example of the council’s leadership at a previous time of crisis. I believe we should extend this fence and install electronic security inside the fenced area. I am mindful of the first class work of the Friends of Frescati in this area and it is not my intention to restrict their access to the site, rather to extend the secure area in keeping with the fire brigade's recommendations about access. Mr Mayor, I visited yesterday’s meeting of the Friends of Frescati to explain my intentions and express my hope for their continued good work, even if it is behind a fence. Debate on this motion was cut short when Cr Nicholson moved a "gag" motion that brought forward the vote without further discussion. Vote tied and therefore the motion was lost. Motion 3. That this council take immediate steps to bring to a speedy conclusion the protracted negotiation of a Memorandum of Understanding with the State Government for the development and protection of the Willow Court historic site. What I said: Mr Mayor, I was dumbfounded last week when it emerged that this council had sent no written response to the draft MOU received from Heritage Tasmania last year. This is not good enough and this matter must be resolved without further delay. Those in favour: Councillors Bester, Lathey, Graham, Bromfield, Evans, Lester, Shoobridge and Nicholson. Motion 4. That this council issue a general apology for its comprehensive failure to protect and develop the Willow Court historic site over the last decade, resulting in the vandalising of all buildings in its care and the complete destruction of one. Motion 4a. That the apology be published as a media release issued by the mayor, as a public notice in a daily newspaper circulating in Tasmania and in a prominent position on the council website. What I said: Mr Mayor, there can be no argument that this council's handling of Willow Court has now turned from poor to disastrous. On our watch, heritage buildings have been extensively damaged, and now, destroyed. Councillors have failed to fully comprehend and respond to the task at hand, and I have failed to convince enough councillors to act. Mr Mayor I have spent two years trying to work co-operatively with all councillors on all issues, but on the topic of Willow Court most of all. Despite early promise, we have made very little progress in those two years and that progress has been wiped out by the loss of a building we failed to protect. Over the 10 years of council ownership of the site we have comprehensively failed our community and wider Tasmania, if not Australia, and for this we should apologise. With this behind us, we can move on, speedily and co-operatively to get this site open to visitors and progressively redeveloped. Motion 5. That this council note and apologise for its failure to implement decisions about Willow Court in a timely manner. What I said: Mr Mayor, the list is extensive so I will restrict my remarks to the period since my election in 2009. We have the matter of the fence, we have various meetings that were requested but never convened, we had the drawn out process of the McDonald Report (before and after it was finished), we have the MOU, and need I say it, we have the financial analysis that is now 26 months overdue. For these things and more, the council should apologise. Motion 6. That this council apologise to its ratepayers for the burden placed upon them by its failure to address the Willow Court issues for the last 10 years, including the loss of grant funds and the poor management of several million dollars. What I said: Mr Mayor, in the absence of the required financial analysis, funds have continued to be diverted from the Willow Court account. In the first six months of the current financial year, nearly $30,000 went on rent, electricity, telephones, security, cleaning and rates, for the office at 2 High St which no longer has any connection to Willow Court. $30,000 in six months. Six month's electricity at Willow Court has apparently cost $20,000. Total expenditure charged to Willow Court since 2002 is $3.9 million and, last Christmas, we had had only $589,000 left in the account. I am afraid to ask whether that includes the $750,000 state grant. For all this Mr Mayor, the council should apologise. Motion 7. That this council congratulate the owners of parts of the site who have successfully protected and developed the parts of the site they are responsible for; and pledge to work co-operatively with them from this point forward. What I said: Mr Mayor, this is the good news. While the council has dithered over the last decade, private individuals have made progress. The owner of the former administration building has publicly stated the figure of $100,000 for the near-complete restoration of his art-deco gem. The owner of a large part of the site has successfully established an antique business and a motel, and has tenants of his own running other businesses on the site. Instead of privately disparaging these people, we should publicly congratulate them and pledge to work with them. Motion 8. That this council thank those members of the community who have volunteered their time to work on the site in the last decade and develop procedures to work more effectively with those community members from this point forward. What I said: Mr Mayor, we have two teams of volunteers at Willow Court. One gratefully appreciates the council's support and the other wishes for a better relationship. We should thank everyone who helps with Willow Court and seek ways to better support everyone who wishes to help. Those in favour: Councillors Bester, Lathey, Graham, Evans, Lester, Shoobridge and Nicholson. Motion 9. That this council make contact with Malcolm McDonald to obtain an estimate of the cost for him to source grants in accordance with the McDonald Report. What I said: Mr Mayor, some councillors have seen fit to criticise Mr McDonald both during the drafting of his report and afterwards. Some have been critical of the report and made claims about the suitability of funding opportunities suggested in it. Mr McDonald stated his willingness to support the council in its efforts to seek funding and we should give him the opportunity to do so. THERE can be no doubt that the council and our community have reached a crisis point in the long-running saga of Willow Court. In response to the disastrous loss of F Ward in a suspicious fire, I have proposed the following motions for the monthly council meeting this Thursday. Your feedback is welcome and I encourage you to make your feelings known to your other councillors. 1. That this council proceed immediately with the installation of permanent security fencing around Wards D, E, F and G at Willow Court. 1a. That council make urgent application to the State and Federal Government for sundry grants to contribute towards the cost of fencing Wards D, E, F and G.
2. That this council proceed immediately to expand the fenced enclosure around Frescati to include the house garden area, including the pond and hedge, and the installation of electronic security inside the fenced area. 2a. That council make urgent application to the State and Federal Government for sundry grants to contribute towards the cost of expanding the fenced area around Frescati and electronic security. 2b. That council develop procedures with the Friends of Frescati to ensure their continued access to the site. 3. That this council take immediate steps to bring to a speedy conclusion the protracted negotiation of a Memorandum of Understanding with the State Government for the development and protection of the Willow Court historic site. 4. That this council issue a general apology for its comprehensive failure to protect and develop the Willow Court historic site over the last decade, resulting in the vandalising of all buildings in its care and the complete destruction of one. 4a. That the apology be published as a media release issued by the mayor, as a public notice in a daily newspaper circulating in Tasmania and in a prominent position on the council website. 5. That this council note and apologise for its failure to implement decisions about Willow Court in a timely manner. 6. That this council apologise to its ratepayers for the burden placed upon them by its failure to address the Willow Court issues for the last 10 years, including the loss of grant funds and the poor management of several million dollars. 7. That this council congratulate the owners of parts of the site who have successfully protected and developed the parts of the site they are responsible for; and pledge to work co-operatively with them from this point forward. 8. That this council thank those members of the community who have volunteered their time to work on the site in the last decade and develop procedures to work more effectively with those community members from this point forward. 9. That this council make contact with Malcolm McDonald to obtain an estimate of the cost for him to source grants in accordance with the McDonald Report. 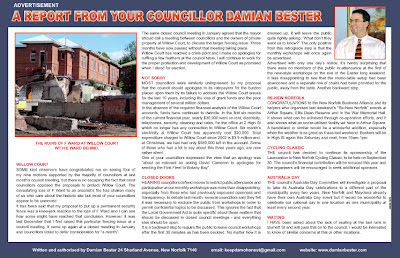 BELOW is my latest councillor update, published in the Derwent Valley Gazette on February 22, 2012. MINUTES of the council's January meeting have been posted on the council website after being ratified at the February meeting last week. Here are the topics I raised during "questions without notice" at the end of the January meeting. Mr Mayor, I was in the minority last year when this council rejected a proposal for a men’s shed and women’s shed to be established at the former business enterprise centre. At what meeting did this council subsequently decide it would support a community shed being established at the same location? Answer: The mayor advised that he would have to check this. Mr Mayor, I was once again in the minority last year when this council rejected a proposal to have aged pensioners living at the former business enterprise centre. Did I miss the council meeting where it was decided to have backpackers living there? Answer: The mayor advised that there was no decision of Council and approval had been made by council staff. Mr Mayor, why have you not seen fit to brief councillors on the accommodating of fruit pickers at the council’s education park? Answer: The mayor advised that he had spoken to some growers about accommodation shortage. He did not consult with councillors as he saw it more relevant to provide the needed accommodation. Mr Mayor, do you believe it is appropriate for this council to go into business in opposition to accommodation providers? Answer: The mayor advised that the demand for the accommodation was greater than what was available. Mr Mayor, at last month’s meeting I requested an update of the Willow Court financials. This was done within days and I received my copy in the first mail after Christmas. Would you please thank the accountant for his prompt attention to this matter? 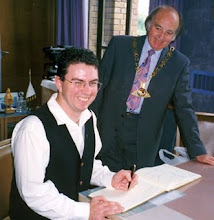 Answer: The mayor thanked the accountant Mr Bradley for his promptness. Mr Mayor, will you provide an update on your search for a tunnel beneath Burnett St? Answer: The mayor provided Councillors with an update on his research into the tunnels. THE Bushy Park War Memorial Swimming Pool Hall will be the venue for the February council meeting this Thursday (February 16). The evening will start with a community forum at 5.45pm, prior to the formal meeting at 6.30pm. Everyone is welcome to attend. This year the council will increase the number of meetings it holds outside New Norfolk. At the first meeting after last year's election, councillors endorsed my proposal that the council hold an extra "country" meeting each year, in order to visit Granton, Molesworth Lachlan, Bushy Park, Westerway and Maydena at least once in every two-year council term. Previously it took three years to complete the cycle. Ordinary council meetings are held on the third Thursday of each month unless noted otherwise. Meetings are generally held at the Court House, Circle St, New Norfolk, at 6.30pm. Special meetings are held as required. All meetings must be advertised in a daily newspaper and the public is invited to attend in most circumstances. Agendas and minutes are available online and at the council office. THESE are the topics I raised as "Questions Without Notice" at the December council meeting. Sorry about the delay in posting them here. The complete minutes of that meeting can be read on the council website here. Mr Mayor: Can you provide an update on the search for information about the tunnel beneath Burnett St? The Mayor advised that he had requested council meeting minutes from the Tasmanian archives. Mr Mayor: Will you request an update of the Royal Derwent Hospital Reserve financial report to the end of the 2011 calendar year? The Mayor advised that he would. Mr Mayor: Does this Council provide an award at Claremont College's annual presentations? The Mayor advised that Council does not provide an award to Claremont College but said it was something to be considered.